To the orchestra of my hunger pangs. In search of my next lunch, supper, and/or breakfast. It is now three days since I last had a meal. I also thanked Him for all your people. And I pray that your generosity continues for ever! In the gust of wind. As they try the “paka chini” dance. Followed closely by it notorious siblings. Like the blinking lights on the Christmas tree. A prelude to the mighty drummer. And climaxes to a thunderous roar! Then the larger drips and faster painful taps! And the pounding rain joins in the chorus. And the music comes to a slow serene stop. 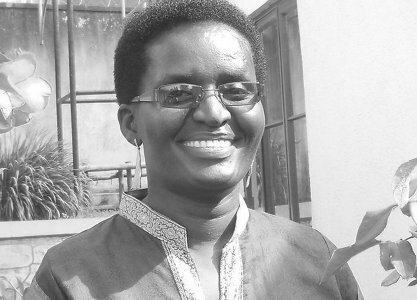 Jane Okot P’ Bitek Langoya is a Ugandan poet and is one of the children of legendary poet Prof. Okot P’ Bitek (RIP). She is a lawyer by training and holds a MBA (entrepreneurship and business venturing). Her love for poetry started way back during her secondary school days where she would compose poetry and plays for the schools talent shows. Her poetry was nurtured particularly by her beloved Head Mistress Sr. Cormack Cephas, who went as far as declaring that if she did not want to study literature in ‘’A’ levels then she should go to another school. At that time she was interested in sciences with a view to becoming a doctor. However this was one of the best schools in Uganda so the Head Mistress’s wish became her command. Her greatest inspiration and influence was her father from whom she adopted the ‘song’ style of poetry. She is a published poet, Song of Farewell, and currently has an unpublished manuscript. Her poetry covers political and social issues, especially those that touch human beings and the rhythm of nature.